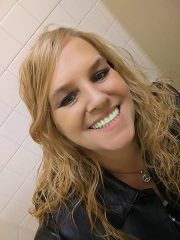 Bobbi Jo (George) Axsom, 46, of Milford, passed away peacefully in her sleep on April 8, 2019, in her home. She was born on March 18, 1973, in Elkhart to Robert Wade and Barbara Carol Williford George. She attended White Pigeon High School in Michigan and was a highly-skilled bartender, waitress, welder and cabinet builder. She was an avid pool player and a member of the Northern Lakes Pool League. Her love for life and country music was second only to her love for her children and grandchildren. A mother hen of sorts, her house was a gathering place for any neighborhood child as they were all always welcome in Bobbi Jo’s house. Her light in life was her grandchildren and her house was a safe haven for the whole neighborhood. Left to cherish Bobbi Jo’s memory are her finance of 10 years: Robert “Rockin’ Rob” Smith; daughters: Chelsi R. Hicks (Jason) Clevenger of Bremen and Gina M. Axsom of Milford; brothers: Robert G. (Kevin Woodman) George of Union, Mich. and David Joseph (Jody) George, of Elkhart; sisters: Sherri (Will Aske) See of Cassopolis, Mich. and Rebekah “Beki” Welch of Elkhart; her stepmother Barbara George of LaGrange and grandchildren Ayden James, Addyson Marie and Logan Michael. She was preceded in death by her parents and step brother Bruce Baker. A Celebration of life for Bobbi will be held on Saturday, April 13, 2019 at 2 PM at Eastlund Funeral Home with Pastor Mike Beezley officiating. There will be a time of calling 2 hours prior to the service from noon until 2.